Indulge without feeling guilty as you benefit from the antioxidant goodness of nuts, dried fruit, and spices! What is an anti-truffle? Classic chocolate truffles are decadent and with your health in mind, they are better saved for special occasions. On the inside, my anti-truffles are full of antioxidant powered ingredients such as figs, pistachios, almonds, and ginger. On the outside, I cover the truffles in a thin layer of dark chocolate for its flavor and for the appearance of a classic truffle. It’s also true that dark chocolate (60% cacao or higher) in small quantities is quite good for you. 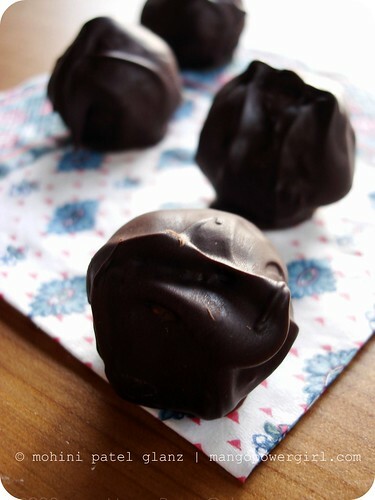 I recently published a classic chocolate truffle recipe my blog. For the readers of Naturopath.ca, I dreamt up this more nutritious way to enjoy truffles on a regular basis, you can think of them as a grain-free granola treat. I enjoy the challenge of making sweets in healthier ways, while at the same time, there is no reason to sacrifice taste to make foods healthier. These ingredients are not only healthy, their own rich and bright flavors also taste wonderful with the bit of dark chocolate. Nuts provide the healthy fats and oils you need in a vegetarian diet. Dried figs are rich in iron and antioxidants, and they are as much as five times more nutritious then fresh figs. Dried figs also aid digestion and are a good source of fiber. Ginger is another powerful ingredient — it has amazing digestive power and is good for people suffering with arthritic inflammation, nausea, and coughs and colds, just to list a few of the known health benefits. I recently saw nutritionist Ellie Krieger making fig & ginger truffles on Food Network. I gave her idea my twist and adjusted ingredients to my taste and our naturopathic purpose. 1. Put the nuts, cardamom, and ginger powder in a food processor and pulse to get small pieces. Do not powder the mixture. 3. Grease your palms with a tiny bit of ghee or oil. This will prevent the fig mixture from getting stuck to your hands as you roll the mixture into balls. 4. Scoop out 1 teaspoon of the mix at a time, roll each into a ball, and place the balls in a tray or a dish covered with a sheet of parchment paper or foil. 5. Melt the chocolate on a double broiler. To do this, use a heat-proof bowl over simmering water, not letting it touch the water. It will only take a few minutes to melt the chocolate, and keep stirring throughout. As soon as it melts, take the bowl off the heat. 6. Drop the fig mixture balls into the chocolate. Use a spoon to roll them around, making sure they are coated on all sides. 7. Once they are coated, spoon them back onto the parchment paper or foil. The chocolate coating should be done as quickly as possible, don’t let the chocolate firm up yet! 8. Refrigerate the truffles for at least one hour before serving.